We are joined once more by Dave Goldberg, author of A Whole New Engineer, to discuss the critical engineering skills of noticing, listening, and questioning. Brian takes a 50/50 shot at guessing whether President Lincoln faces left or right on the United States one-cent coin. For younger listeners, Jeff describes the features of a telephone keypad, once a common element of everyday life. He also waxes nostalgic about telephone directories. Our guest for this episode is Dave Goldberg, founder and president of ThreeJoy Associates, Inc., who leads us in a discussion of noticing, listening, and questioning (NLQ). Noticing, in the context of our conversation, is less about recalling fine details, and more about remaining open to alternate interpretations of one’s thoughts, emotions, and sensory inputs. Dave proposes that the three domains of noticing are language, emotion, and body. Brian asks if noticing is hindered by pareidolia, the mind’s tendency to assign meaning to random patterns. The invisible gorilla video has been viewed over 16 million times on YouTube, and highlights our selective awareness. An associated book, The Invisible Gorilla: How Our Intuitions Deceive Us, provides additional information about how faulty intuitions often get us into trouble. Our guest offers a quotation from Scottish psychiatrist R. D. Laing. Dave notes we are free to manufacture new narratives that are capable of benefiting our well-being, while remaining consistent with our perceptions. Jeff relates that his interpretation of others’ intents was significantly altered when he participated in a DISC personality assessment at work. Observer, action, and results are three components of the OAR learning model offered by Dave. Our guest mentions a book by Daniel J. Siegel, Mindsight: The New Science of Personal Transformation. Adam, Brian, and Jeff participate in a simple breathing exercise with Dave. Chade-Meng Tan was one of Google’s earliest engineers, contributing to projects in mobile search and search engine quality. He is now best known for starting “mindfulness training” courses within Google. He has written a book about mindfulness, Search Inside Yourself: The Unexpected Path to Achieving Success, Happiness (and World Peace). Jeff makes a reference to “hippie,” which may be a new term for younger listeners. Dave explains differences between Level 1 and Level 2 listening. Dave mentions Dale Carnegie’s famous book, How to Win Friends and Influence People. Our guest also references Mark Goulston’s book, Just Listen: Discover the Secret to Getting Through to Absolutely Anyone. Big Beacon now has an Education Innovators Working Group (EIWG), and sponsors Students for a Whole New Education (SWNE). Dave can be reached through the website for his consulting firm, ThreeJoy Associates, the website for his book, A Whole New Engineer, or via email: deg511 -=+ at +=- gmail -=+ dot +=- com. 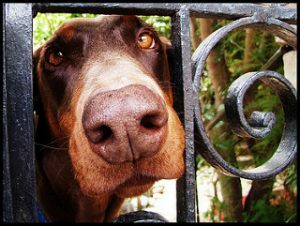 Thanks to Flavio~ for use of the photo titled “Before it Started Barking.” Notice any similarity between the dog’s nose and the ironwork? Opening music by John Trimble, and concluding theme by Paul Stevenson.